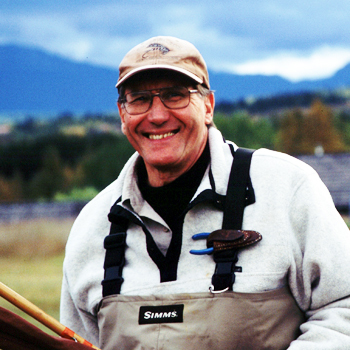 Lani has been fly fishing for trout and steelhead for over fifty years and is considered one of the foremost experts on trophy British Columbia steelhead. His three award-winning videos done in 1984 for Scientific Anglers 3M on steelhead fishing have become classics and are considered the most accurate and complete treatment of the subject ever done. Lani added another steelhead film to the 3M series, in the fall of 2007 and it was combined with the three original films. Lani Waller has pursued steelhead for over four decades and is considered one of the foremost experts on trophy British Columbia steelhead. Learn Lani's best techniques for catching steelhead on the fly. All four of these films were released in 2008 as a four part series called Lani Waller's Steelhead Legacy. Lani has written two books- A River of Dreams, published by West Rivers Publishing in 2004, and A Steelheader's Way, published by Headwaters Books in 2009. Personalized copies of his Steelhead Legacy, DVD and both books are available from the author at World Wide Anglers. Lani's articles and stories have appeared in all the major fly-fishing publications and he has held editorial positions for Fly Fisherman Magazine and Wild Steelhead and Salmon Magazine. He serves as consultant to Sage Rod Co, Scientific Anglers 3M, Rio Line Co. and Umpqua Feather Merchants. Lani is a founding Director of The Babine River Foundation and is active in British Columbia watershed conservation politics. As such he has held consulting and fund raising relationships with The Wild Steelhead Campaign, Friends of Wild Salmon. Lani was a founding Director of British Columbia's North Coast Steelhead Alliance. His conservation work in the US includes fund raising and promotional activities in behalf of California Trout and Trout Unlimited. His photographs and slide shows of wild steelhead have been viewed by audiences across the United States; his photographs and field work with California wild steelhead and salmon have been preserved in the California State Archives. He also enjoys salt water fly fishing and has over twenty five years salt water fly fishing experience for all types of inshore and offshore species, from bonefish, tarpon and permit to tuna, and sailfish; Lani has taken successfully taken Blue Marlin on the fly, including one specimen of 240 pounds. His fly patterns have been featured in the leading US fly fishing magazines and some of these are currently being produced by Umpqua Feather Merchants. Other patterns have found their way into common usage through such companies as Idylwilde Flies of Portland Oregon. For more information on Lani Waller's hosted fly fishing trips, books and DVDs visit his web site at World Wide Anglers.